Best scope for an AR-15? Does Darrin know that she thinks that? After several years of damage control, I've convinced her that Darrin is just a great guy, (which he is) and was just rewarding me for being his friend. You crack me up me, Man! I think I've hurt a rib laughing! THAT is good stuff! That is some good stuff, CT! I am facing the same problem. I did find a mount and put a scope on it. Hope to take it to the range today and see if it can get on paper. I can get a jaw weld but it's too high for a cheek weld. The SWFA photos from Iraq shows a trooper with a Super Sniper mounted on a carry handle. 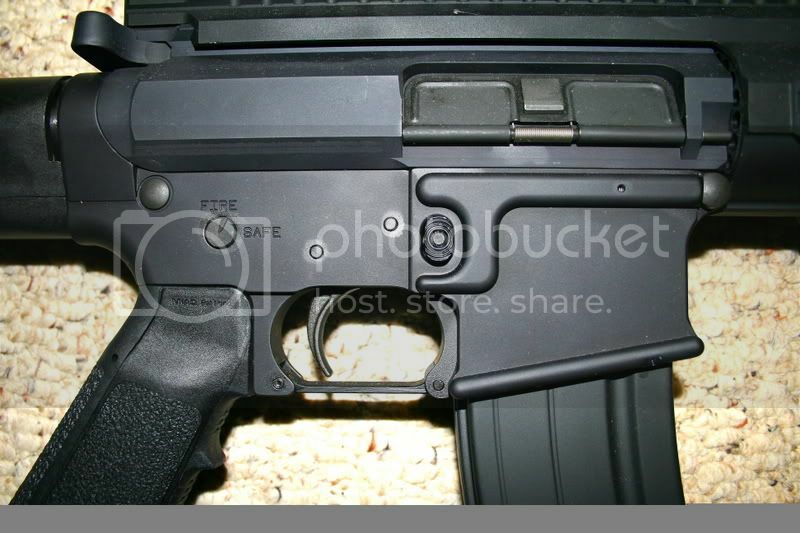 DPMS sells a stripped upper with a raised rail, no forward assist or trap door for about $115. I don't know how much a gunsmith would charge to switch the barrel. 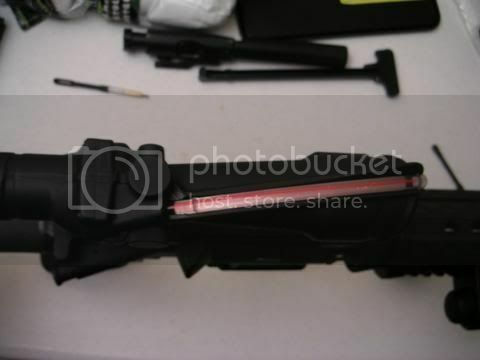 Here is the deal on mounting to an A2 (carry handle style) upper. Colt used to make a small 4x scope about six inches long that mounted securely to the one hole arangement in the carry handle. Rather than a fancy nut on the bottom to secure the bolt it had a piece of spring steel that was about an inch and a half long with the hole for the bolt at one end and when installed the other end clipped securely against the under side of the carry handle with a notch to keep it from moving - using the spring steel to prevent it from unscrewing itself due to recoil. I will note that with Trijicon scopes designed for the carry handle -- the scope is drilled and tapped for two bolts and the second bolt can be purchased and a corresponding hole drilled to provide a second anchor point. I am sure someone with a good drill press could drill and counter sink holes for a couple of additional bolts in the typical carry handle base. Problem is that it still leaves you with a cheekweld problem for anything but an aimpoint (where head position doesn't matter). Arms version is better but I still think the original Colt design was the most secure. A4 - is a forged flattop receiver with a 1913 rail section on top, rather than a carry handle. It too has the forward assist and case deflector, though there are a couple of groups looking at offering slickside A4 uppers. Any forward assist can, as usual, be installed, however, they are almost uniformly provided with small button forward assists unless changed by the end user. What something like this? It is the Sun Devil milled receiver on my Grendel build. Ooops forgot the pic, here it is! I've been married a long time and I'm a liar. I sneak new guns in. When I have to buy another safe the gig is up, though. That is why I bought the safes in advance. I have enough space for a bit over twenty new long guns, so I am set for a little while. Since my wife does not really look into the safe all that much, and since there is still a fair amount of space out front left, another new gun will not make any difference. I had to get another safe for the office since I have to spend so much time here. There usually are several gun projects or scope swapping going on. This keeps the confusion factor operational. She does not know which safe should be full. Its hard for her to keep up with which safe should be full. I will be using this rifle for longer shots (hopefully), and plan on taking it on a prairie dog hunt this summer as an 'extra' gun. As always, any and all input is appreciated! Here is an update on my project. I took all the good advice and invested in a new flat-top upper. I was anxious to try it out, so I slapped some weaver rings and a emergency scope on it- and the rifle can shoot. Considering a little wind, hateful eye relief, and pond-water optics (which reminded me I put it in a drawer..) I shot some decent groups in the break in. By the way, how do you post a picture on the forums? Now, I need input on the scope. The last one I bought was a Nikon 4-16 BDC and I really like it. Is this a good choice for the AR? I have Medium height rings, I noticed other pictures of a 'spacer' between the flat top and the rings, which is best? For the AR I like anything that can be used both eyes open and can give me the advantage of some illumination of the reticle. Holosights are perfect as far as I am concerned and there are some nice lower power scopes that will give the same type of CQB abilities. The "spacer"you are referring to is also commonly called a riser. There are many different ones out there, for various applications. You don't need anything fancy, but you will need something unless you get rings with a height of about 1.4 inches, as are my (perfect for me) Badger Ordnance Ultra-High rings. If you are going to shoot Prairie dogs with this rifle, as your original post indicated, a 4-16x Nikon would be a great choice! 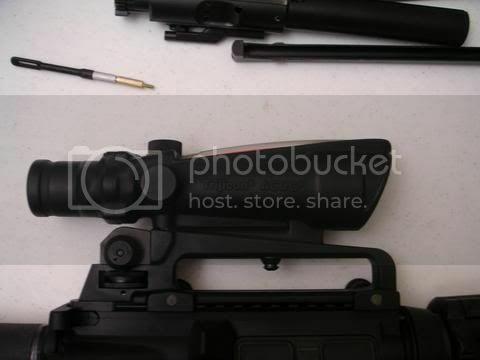 Here is a pic of my AR Carbine with a carry handle mount made by USO. Shown with SN-12 fixed 4x optic. welcome, nice rig, talk about that scope will ya!!!!!!!! How on earth can you shoot that thing? I have never seen a scope mounted higher above the bore. Not really knockin' it but that would not work for me. My thoughts exactly, hard to have consistency with that setup. I am late to the party but I like the 4x ACOG . Is that a 4x32? It looks a little longer like the 3.5x35. I always just say 4x.